This product is a factor that has gained strong market goodwill to our organization. Our offered product is manufactured using supreme grade materials and latest techniques under the observation of our experienced team. 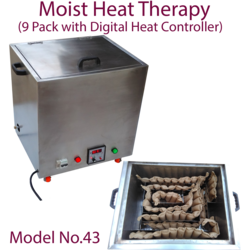 Extensively used in hospitals, nursing homes and health care centers, this is demanded for use in wax therapy. 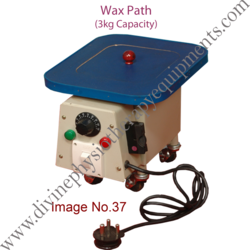 Clients can avail the provided wax bath in various specifications as per their needs at market leading rates. 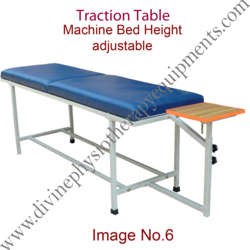 The Traction Table is a Two-section table with a friction-free scoot upholstered section and fixed bed . When not delivering traction it can be used as a treatment table. 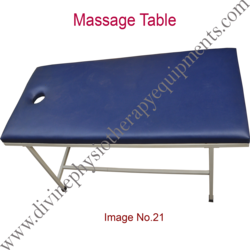 The Traction Table is made up of high graded matrials either it may be a bed rexene or it may be a metal frame. It is facilitated with a cushioned top, with 90mm thick cushion. It has rust proof body and acknowledged for its reliability and durability. It is available in the size of 78" (2000mm) length x 30" (750 mm) breadth x 30" (750mm) height. The movable bed is of the size 42" length x 24" breadth. The fixed bed is of the size 36" length x 24" breadth. This product is a factor that has gained strong market goodwill to our organization. Our offered product is manufactured using supreme grade materials and latest techniques under the observation of our experienced team. 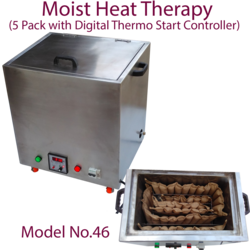 Extensively used in hospitals, nursing homes and health care centers, these are demanded for use in wax therapy. 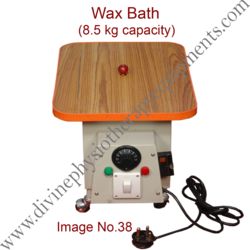 Clients can avail the provided wax bath in various specifications as per their needs at market leading rates. * Tank is made of heavy powder coated steel used and is mounted on ball bearing rubber castors, for easy mobility. * Works in electricity 230 volts. * Special tanks fitted with immersion type heaters. 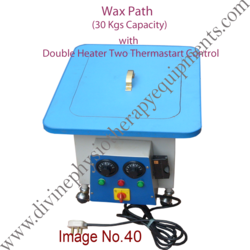 Thermostatically controlled Temperature for wax melting. 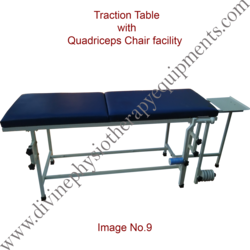 With wide and rich industrial experience, we offer traction table with quadriceps chair. 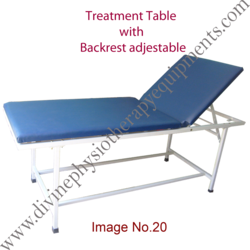 This is a Two-fold fixed upholstered traction table with quadriceps chair facility with cushioned top. 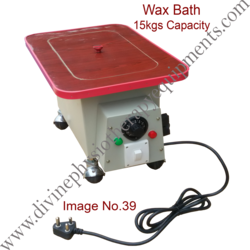 Superior quality raw materials and rust proof body is used to ensure durability. It is used in hospitals and fitness centers to treat the back pain by gently stretching the back and Thigh Muscles back pain. 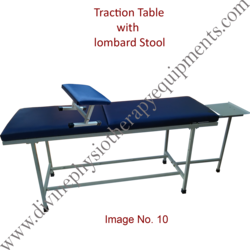 We commenced our business in the year 2008, engaged in providing supreme quality Foldable Massage Table. It is available in gradation of designs, patterns and finishes as per client's specific needs. This is manufactured as per the latest trends of the industry by making use of high quality materials. Our offered table is designed in accordance to the healthcare center and spa center. Clients can avail this from us at industry leading prices. 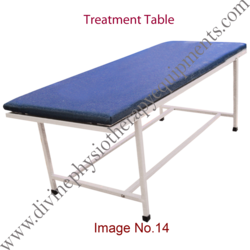 Our organization is involved in manufacturing, Height adjustable Treatment Table at a wide range. Keep pace with the changing trends of the market, we have emerged as a distinguished organization of high quality Automatic Tilt Table. This is precisely manufactured by making use of quality approved materials under the guidance of our team. It is widely utilized at hospitals, nursing homes for diagnose dysautonomia or syncope. Furthermore, our valued clients can avail this at affordable prices in the market. We are engaged in manufacturing, a good quality CP Chair with Standing Frame. We can use this for treating a 2 years old child to 20 years adult (2 in 1). 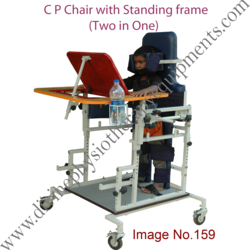 A Cerebral Palsy child is treating to sit and stand using this product. The unstable neck is made stable, by holding them using the neck arrest. Backrest front and back is adjustable. Activity tray height, front and back is adjustable. The side support of the seat is adjustable. Wheels (casters) are attached for smooth movement and provided with break. The width and height of the neck support is adjustable for neck arrest. High quality powder coat finish is used for this product. We are engaged in manufacturing, a good quality Standing Frame with CP Chair. We can use this for treating a 2 years old child to 20 years adult (2 in 1). 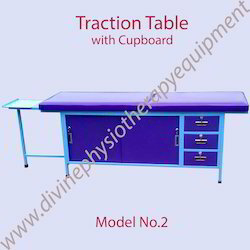 Our organization is involved in manufacturing, Traction Table at a wide range. 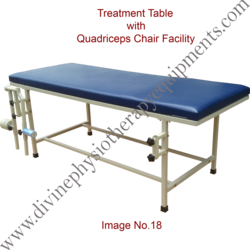 This is a two part upholstered Traction Table, with one movable bed and one fixed bed. We can fix any company's Traction Machine with this table. 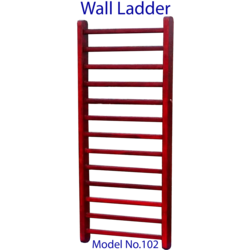 It is available in the size of 78" (2000mm) length x 24" (610mm) breadth x 30" (750mm) height. 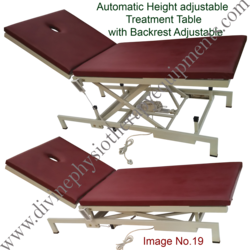 We are involved in the development of Traction Table that has an ergonomic design. 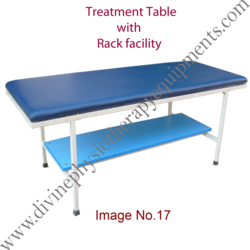 This is a two-part upholstered traction table with cushioned top. It has a rust proof body and acknowledged for delivering long lasting performance. It is used to relieve the back pain by gently stretching the back. These tables are cost-efficient and reliable. Quadriceps facility Lever sets with one kg weight 5 nos. 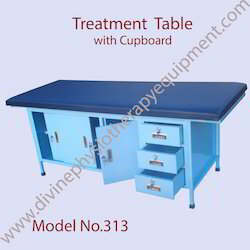 Under able guidance of our skilled professionals we offer treatment table (Examination table). This table is manufactured with thick and hard iron with powder coating and cushioned top. The table is less expensive and has prolonged life duration. It is available in two different size. 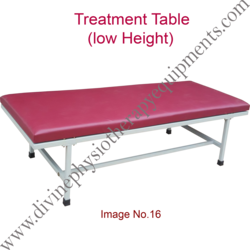 Under the guidance of skilled professionals, we manufacture and offer Examination Couch (Treatment Table) with Rack. This table manufactured with thick and hard CR Pipes. The table is provided with a rack for the storage purpose. It is facilitated with cushioned top with 90mm thick cushion. This table is less expensive and has prolonged life duration. The rack is of the size, 60” length × 22” breadth. 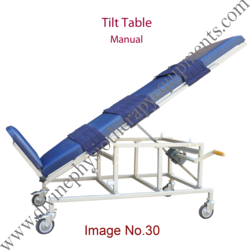 It is available in the size of 78” (2000mm) length × 30” (750mm) breadth × 30” (750mm) height. This table is also available in the size of 78” (2000mm) length × 24” (750mm) breadth × 30” (750mm) height. This table is also available in the size of 72” (1850mm) length × 24” (600mm) breadth × 30” (750mm) height. 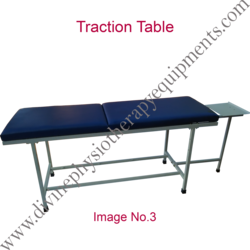 This Treatment Table is manufactured with thick and hard iron with powder coating and cushioned top. 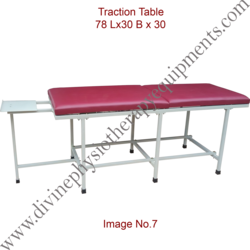 Under the guidance of skilled professionals, we manufacture and offer Examination Table (TreatmentTable) with Back Rest Adjustable. The back rest is adjustable from 0-85 Degree, so that it can be lifted up or made flat according to our requirements. It is available in the size of 78" (2000mm) length x 30" (750mm) breadth x 30" (750mm) height. 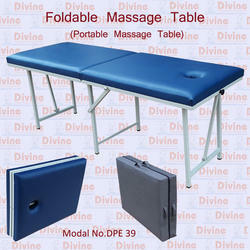 Under the guidance of skilled professionals, we manufacture and offer Massage Table (Treatment table). A hole is provided on the bed, for the patients, to breathe while lying face down. This table is also available in the size of 78" (2000mm) length x 24" (750mm) breadth x 30" (750mm) height. This table is also available in the size of 72" (1850mm) length x 24" (600mm) breadth x 30" (750mm) height. 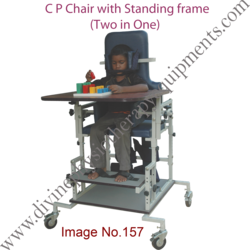 We are engaged in manufacturing and exporting a wide range of Pediatric Automatic Tilt Table. 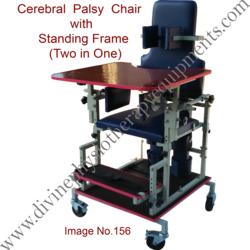 The Pediatric Automatic Tilt tables offered by us are manufactured using advanced machines and superior quality raw material as per the set industry standards and norms. Moreover, the Tilt tables offered in various specifications to meet the variegated requirements of our clients. 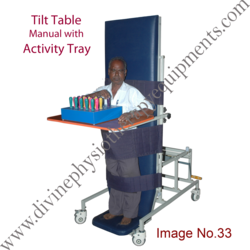 We are engaged in manufacturing and exporting a wide range of Tilt Table manual. 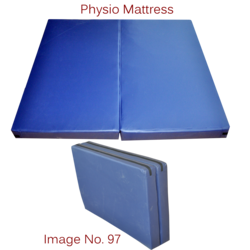 This Tilt table manual offers a smooth and quiet tilt function and manufactured using superior quality raw material as per the set industry standards and norms. 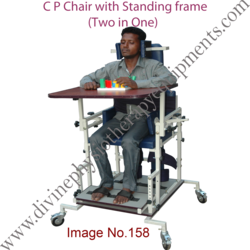 Moreover, the Tilt table Manual offered in various specifications to meet the variegated requirements of our clients and doctors. · 12 inches belt for stomach support. 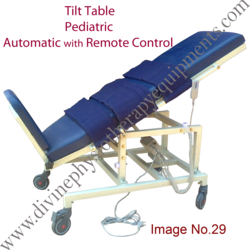 We are engaged in manufacturing and exporting a wide range of Tilt Table Deluxe. The Tilt tables Deluxe offered by us are manufactured using advanced machines and superior quality raw material as per the set industry standards and norms. Moreover, the Tilt tables offered in various specifications to meet the variegated requirements of our clients. 4. 5 inches High Quality Wheel with Two Break. 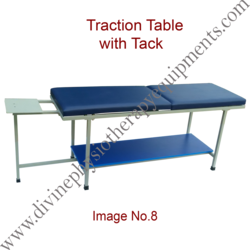 With extensive industry knowledge and integrated approach in manufacturing and exporting, we offer Tilting Table Manual with Activity Table. Having sound infrastructure facilities, we monitor the quality of the product, we manufacture. 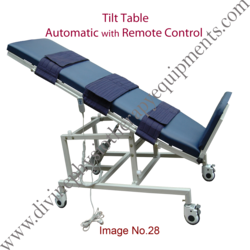 This kind of assortment is perfectly designed with a supportive back rest, moveable wheels ordinary type at the bottom to carry over the patients and 3 tie-up belts to hold the patients. It is predominantly applied in specialty hospitals. We sell them at a reasonable price. 4. Activity Tray Height adjustable & Frant and Back adjustable. 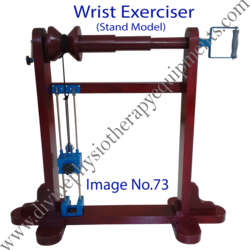 made up of teak / Padac wood stand with roller in 3 different dimensions fitted with weights and pulley for resistance control suitable for flexion and extension exercise of wrist and forearm. A handle is also proved for supination and pronation exercise. Floor / stand model. 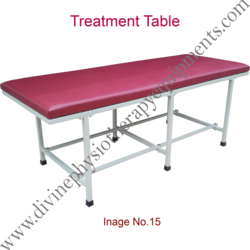 Under the guidance of skilled professionals, we manufacture and offer Treatment Table (Examination Table). - This table manufactured with thick and hard CR Pipes. - It is facilitated with cushioned top with 90mm thick cushion. - This table is less expensive and has prolonged life duration. - High quality powder coat finish is used for this product. 1. It is available in the size of 78" (2000mm) length x 30" (750mm) breadth x 30" (750mm) height. 2. This table is also available in the size of 78" (2000mm) length x 24" (750mm) breadth x 30" (750mm) height. 3. This table is also available in the size of 72" (1850mm) length x 24" (600mm) breadth x 30" (750mm) height. Wall Lader, This Product use for Physiotherapy Treatment. Looking for Exercise Therapy Equipment-1 ?